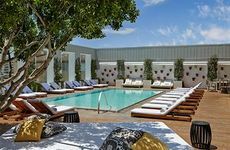 Find Mondrian Los Angeles deals, discounts and special offers. Mondrian with full-service spa features eclectic, contemporary décor, 237 generously scaled guestrooms, & fine dining. Chamberlain boutique hotel incorporates luxurious amenities into its 114 sizeable guest rooms and suites. Mediterranean-style Grafton features a heated pool & state-of-the-art fitness center, on Sunset Strip in West Hollywood. Urban-inspired suite Le Montrose features in-room spa services, cocktails and dinner at Privato Restaurant & Lounge. Chic West Hollywood Le Parc features 154 suites, spa facilities, full-service gym, & award-winning dining. Urban Lodge Palihouse has 36 studio,1-2 bedroom suites & residences as well as major loft residence. In West Hollywood, Sunset Marquis has 102 suites & 52 Mediterranean-style villas, butlers, & two outdoor heated pools. Newly renovated, this 1929 15-story Sunset Tower by architect Leland Bryant, is pet-friendly, in West Hollywood. London in West Hollywood features 200 open floor plan suites, a personal concierge service, and fine dining. This 257-room hotel is centrally located, and offers a restaurant and bar. caters to a young-spirited clientele who appreciate the hotel's timeless and modern design and offbeat sensibility. Located one block from the Sunset Strip, this hotel features a rooftop pool with candle lit lanterns and a fireplace. Located between Beverly Hills Hollywood and Los Angeles, the hotel features an outdoor heated pool with sundeck.